What it’s about: In 1892, three months after Dr. James Naismith invented the game of basketball to entertain some bored teenagers at a Canadian YMCA, the first game played in public took place at a YMCA-affiliated college. The students beat the faculty 5-1, but the school’s football coach—who scored his team’s only basket—would go on to revolutionize basketball, football, and baseball, becoming perhaps the most important figure in American sports despite being relatively unknown today. Biggest controversy: In 1946, Stagg was forced out as a football coach for being too old. He got another job, and continued coaching until he was 96. While he coached baseball and (briefly) basketball, Stagg’s main occupation was coaching football, a sport he had played at Yale, helping the Bulldogs go undefeated in 1888. His first paid coaching job was at Williston Seminary in 1890, a position he held on his day off from coaching Springfield College’s team. Two years later, he moved up to the University Of Chicago, where he coached for 40 years before being pushed into retirement at age 70. But he simply got another coaching job, with College Of The Pacific, until he was pushed out at age 83. He then went to Susquehanna University, where he co-coached with his son, Amos Jr., and when he left that job at age 90, he served as kicking coach at his local junior college until finally retiring for good at 96. He lived another six years. 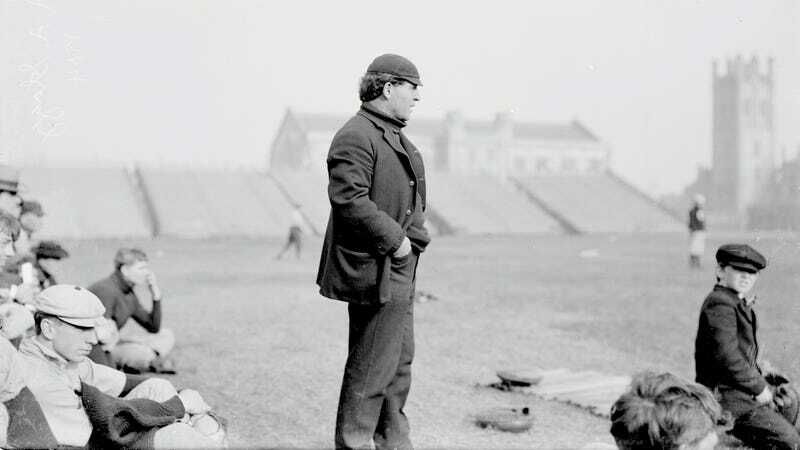 In between 68 consecutive seasons of college football, Stagg also found time to coach the University Of Chicago’s basketball (1920-21) and baseball teams (1893-1905; 1907-13), as well as the 1924 U.S. Olympic Track And Field team. He had a career record of over .600 in all three of the college sports he coached. Strangest fact: Stagg has a minor connection to the Manhattan Project. Nearly everywhere he coached has a Stagg Field named in his honor; the University Of Chicago’s Stagg Field was where Enrico Fermi’s team of scientists created the first artificial nuclear chain reaction. (The stadium was abandoned at the time, and a newer facility a few blocks away now bears Stagg’s name). Thing we were happiest to learn: Stagg transformed every sport he touched. In no small part because he was there for the formative years of all three sports, he made lasting contributions to baseball (he invented the batting cage), basketball (it was his idea to have five players on a side), and during his decades in football created too many vital parts of the game to list here. Diagramming plays. The reverse. The snap. The huddle. The onsides kick. The lateral. The Statue Of Liberty Play. The T formation. Putting a man in motion. Padded goalposts. The linebacker. Varsity letters. Numbers on the uniforms. All Amos Stagg. He didn’t invent football in the same sense that Henry Ford didn’t invent the automobile—he contributed so much that the distinction hardly matters. Thing we were unhappiest to learn: Because he started coaching young, he didn’t quite get his due as a player. While he was an All-American football player at Yale, the NFL wouldn’t form for another 30 years, so there were few opportunities to play post-college. But he was also a pitcher for Yale’s baseball team, and fielded offers from six different pro teams. That’s all the more impressive when you consider the National League had only eight teams, and the soon-to-be-defunct American Association had nine. But Stagg turned them all down to coach football. Best link to elsewhere on Wikipedia: Stagg also has a place in a strange, elite fraternity—the 11 college football coaches who coached games in stadiums named after themselves. Naturally, that list has its own Wikipedia page, and naturally, Stagg’s the only coach to have pulled off the feat twice (while at Chicago and Pacific). Side note that may only be interesting to someone who grew up in Buffalo in the ’80s: Also on the list is Larry Wilcox, who has been the head coach at Benedictine College since 1979. The school has just over 2,000 undergrads, and Wilcox coached one of only two alumni to play in the NFL. One was Irv Comp, Green Bay’s quarterback from the 1940s, and Wilcox’s charge was Jamie Mueller, backup to Thurman Thomas in the years leading up to the Bills’ first Super Bowl loss. Virtually every time Mueller carried the ball, the announcers dutifully repeated the only piece of info they had on Mueller: He graduated from Tiny Benedictine University. Surely there were a lot of Tiny Benedictine alumni who swelled with pride every time that factoid was dropped, and were momentarily taken back to their carefree days at good ol’ Tiny Benedictine. Further down the Wormhole: Stagg also had an acting career, albeit a brief one. He played himself in the 1940 film Knute Rockne, All American, alongside cameos by college coaching legends Pop Warner, William H. Spaulding, and Howard Jones. Rockne himself was a legendary coach, who coached Notre Dame to three national championships in the ’20s before dying at age 43. But the best-known performance in the film came from future president Ronald Reagan, who, as George Gipp, a real-life Notre Dame player who died of strep throat at 25, exhorts Rockne on his deathbed to “win one for the Gipper.” Gipp was remembered by the film, but also by the U.S. Navy, who would name a liberty ship after him during WWII. We’ll look back on the days when punching Nazis wasn’t up for debate, next week.